3. )Whether conduct constitutes an unfair or deceptive trade practice is a question for the trier of fact. The majority of the discussion relates to the first issue. The appellant argued that "although he may be liable for professional negligence, any such liability is capped by the limitation of liability provisions present in the GMWA Agreements." 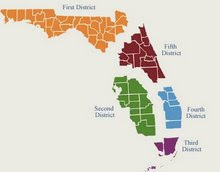 The Third District disagreed and stated that "In Moransais, the Florida Supreme Court tacitly acknowledged that an extra-contractual remedy against a negligent professional is necessary because contractual remedies in such a situation may be inadequate. Moransais, 744 So. 2d at 983." "Because a professional negligence claim exists and operates outside of a professional services contract, it would be inapposite to limit such a remedy to the confines of the very document outside of which it was intended to operate. A cause of action in negligence against an individual professional exists irrespective, and essentially, independent of a professional services agreement, as evidenced by section 492.111(4) and Moransais, and, therefore, we find that the limitation of liability provision was, as a matter of law, invalid and unenforceable as to Witt."